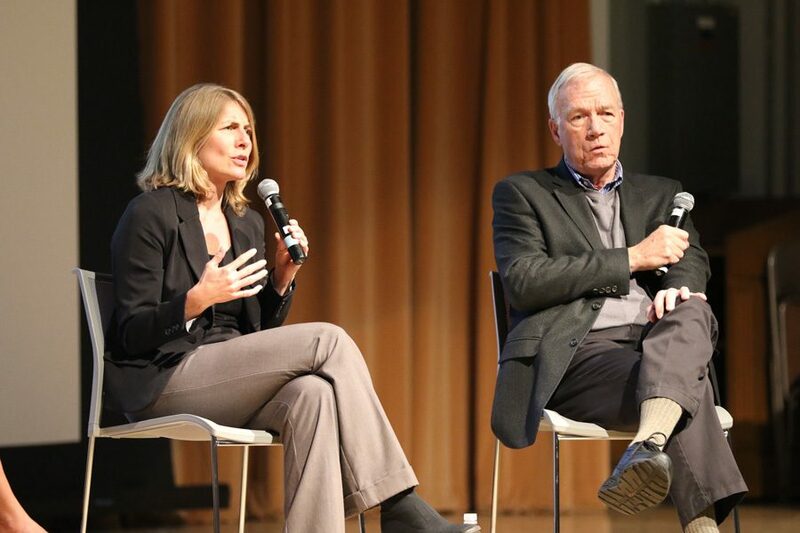 Boston Globe journalists Sacha Pfeiffer (left) and Walter Robinson discuss their Pulitzer Prize-winning work that uncovered a series of Roman Catholic Church sexual abuse cases in Boston. The journalists visited Northwestern during an event hosted by A&O Productions and Studio 22. Robinson and Pfeiffer spoke Tuesday night to about 250 students after a screening of the film hosted by A&O Productions and Studio 22. During the Q&A session, moderated by Medill Prof. Mei-Ling Hopgood, Robinson and Pfeiffer spoke about their experiences writing the story and collaborating with the film’s actors and creators more than a decade after. Pfeiffer said the film reminded her of the power of Hollywood because she continues to receive emails from viewers worldwide who might have been unaware of the scandal before, even though the story was published more than a decade ago. Even the Catholic Church, she said, had a more positive reaction to the film than to the original story. “The church has embraced a movie in a way that it didn’t embrace our story a decade ago,” she said. Raised in a devout Catholic family, Pfeiffer said her upbringing helped her understand why people would choose to ignore these sexual abuse cases. Though the journalists said the movie made some of the investigative parts of their reporting seem more interesting by fast-forwarding scenes where they were doing “tedious” research, they emphasized the importance of investigative journalism. They said their series gave a voice to sexual abuse victims who previously hadn’t had a way to share their stories. Robinson encouraged students to become reporters and said journalism is a good way to effect change. Communication freshman Andrew Harlan said he had never seen the film before, but was shocked by the movie’s list of places worldwide where the Catholic Church had been involved in cases where abuse by priests were concealed, which is shown before the credits.